Editor’s Note: I’m not a technologist, however I am someone that thinks about mobile frequently from a marketing and product perspective. Below are a few of my thoughts (disclosure at the bottom) on the role of mobile web and RWD. Comments and criticism are welcome and appreciated. However, I’ve been giving that question a lot of thought recently, and I think my opinion has changed. For those of you that need a quick refresher (or for my family and friends, who read these posts despite not understanding a word of them): Responsive design is an approach to web design that attempts to adapt and resize the layout of a website across several device types. In essence, the theory suggests that a mobile and tablet version of a website should match the experience of the desktop version. One of the biggest arguments to support responsive design is that web visitors are increasingly viewing sites from a number of different devices, and therefore, they shouldn’t have to re-learn how to navigate your site each time. This argument makes a lot of sense. An increasing share of web consumption is occurring on mobile devices. 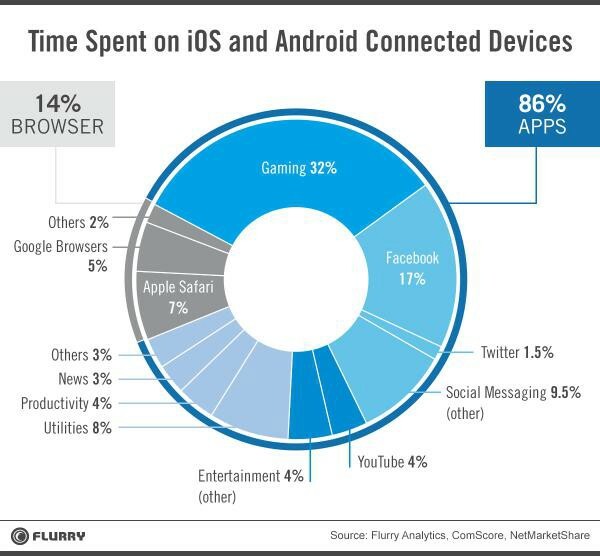 These users don’t create a distinction between mobile and desktop consumption, so why should publishers? It also doesn’t hurt that designing a responsive site is often cheaper to create and maintain, as it doesn’t require developers to repeat changes across a number of different templates. However, I’ve started to believe (at least for now) that following this approach may dismiss the nuances of different reading behaviors, and ignores the strengths and weaknesses that each device offers. Much of the web consumption that occurs on mobile devices takes place within in-app browsers that iframe a publisher’s mobile website within another app’s experience (Facebook, for instance, opens external links within a Facebook app browser). Users directed to external sites from these platforms are typically looking to do one thing — read an article, watch a video, make a quick purchase, etc. Once that action is performed, these users often return to whatever platform or app brought them there. This isn’t to say that attempting to deepen user engagement on mobile is a lost cause — it isn’t. But I don’t think it’s fair to assume that the same navigation, advertising or purchase tactics that work on desktop will be nearly as effective on a smaller screen. I believe publishers must abandon this one-size-fits-all approach, and start thinking about mobile web as a uniquely mobile experience. Most publishers are already doing this on their native mobile applications. The look and feel of the New York Times native app is different than that of its mobile website (which is responsive in some places, and not in others). The difference is even more drastic when you look at the newer NYT Now app. 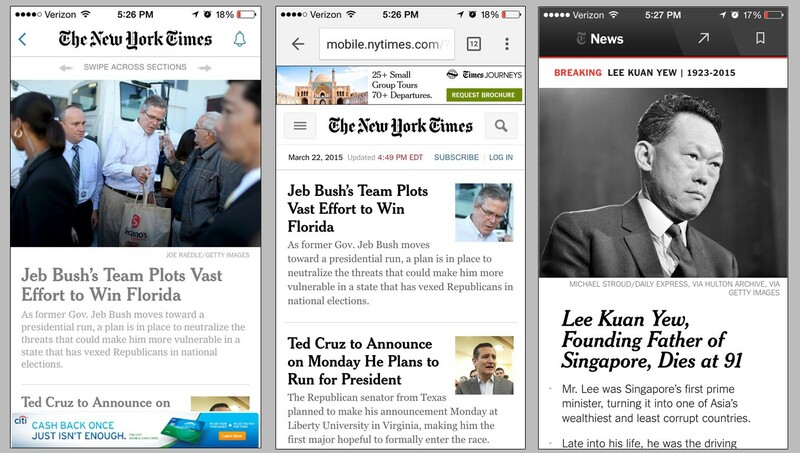 From left to right: The New York Times for iPhone, mobile.nytimes.com, NYT Now for iPhone. Publishers have high hopes for native apps to help fill the void of diminishing homepage traffic. Native apps are much better at monetizing ad impressions, leveraging location data, and reengaging users via push notifications than mobile websites. However, the reality is few people consume news from a single native news app (and I suspect that disparity is even greater when examining a segment of the least-engaged users). So should publishers stop developing native apps? Absolutely not — at least not until we can monetize the mobile web as well as we can monetize native. However, I do believe that equal, if not greater, attention must be paid to developing superior mobile web products. This is, after all, the first impression many readers will have of our sites. There has been a growing trend of platforms suggesting that the mobile reading experience is broken, and that they are uniquely positioned to improve that experience by hosting publishers’ content on their own servers. These platforms argue that publishers’ mobile sites load too slowly, don’t make effective use of the smaller screen sizes, or simply don’t monetize eyeballs as well as they could. I’m not going to delve too deeply into this (I’ve already written about this at length), but I see this as a very troubling trend for publishers. These platforms may be right: the mobile reading experience is probably not where it should be given the large percentage of users that visit our sites from mobile devices. But isn’t that something that we ought to be able to fix ourselves? The mobile revolution has only just begun. It’s time we start capitalizing. If you liked this post, please click the recommend button below! Disclosure: All opinions in this post are my own, and do not reflect the views of The New York Times Company. Head of Stategy at Wirecutter. Product and Audience Development at The New York Times and social at The Huffington Post before that.